It's usually a band's sophomore release that makes or breaks them. And while Handguns may only be releasing their second EP of seven songs, it's these tracks that will prove sink or swim for the Pennsylvania quartet. What fans of Handguns will be looking for is consistency. The band's first release, Anywhere But Home, was a quick, but memorable slice of pop-punk that meant something. This was a record that reflected the do-it-yourself spirit of pop-punk. It was the self-released, living out of a van, type of music that was missing from the scene. 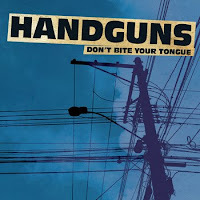 So, can Handguns' new EP, Don't Bite Your Tongue, live up to everything off their first release - without being a mirror image of the record? You bet it can. One listen through the EP and it's clearly Handguns. Forget the frills and producer tricks. This is straight pop-punk courtesy of a guitar, bass and drum kit. It's a snare happy, palm muted ride reminiscent of early 2000s pop-punk. Fast, fun and catchy - what more could you want? Pop-punk has always had a certain nostalgic effect to it. Songs about lost love and better times, old friends and wasted youth - these are the concepts that defined the movement at its roots. Handguns know this, and show it with ease on Don't Bite Your Tongue. The song "I Hope He Kills You" starts with lead singer Taylor Eby exclaiming, "I'll pretend my heart's not breaking / It's taken everything I have not to call you back / And I hope he breaks you down / The next time you call, I won't be around." Couple these heart crunching lyrics with Eby's matured vocal approach and an instrumental take that relies as much on bass as it does on guitar and drums, and what you have is one of the most well rounded songs on the EP. The message of the record is clear. Where playing shows and the open road defined Anywhere But Home, raw energy and emotion define Don't Bite Your Tongue. This essentially makes for the most relatable and solid grouping of tracks Handguns have ever put out. So sink or swim? Despite track three's title ("Sink Like Lead"), this release should please the masses. It's consistent with what fans are already accustomed to, but catchy and relatable enough to reach a whole new pop-punk fan base. This EP definitely does more than tread water. Swim, swim, swim. awesome review! Can't wait to get my pre-order!